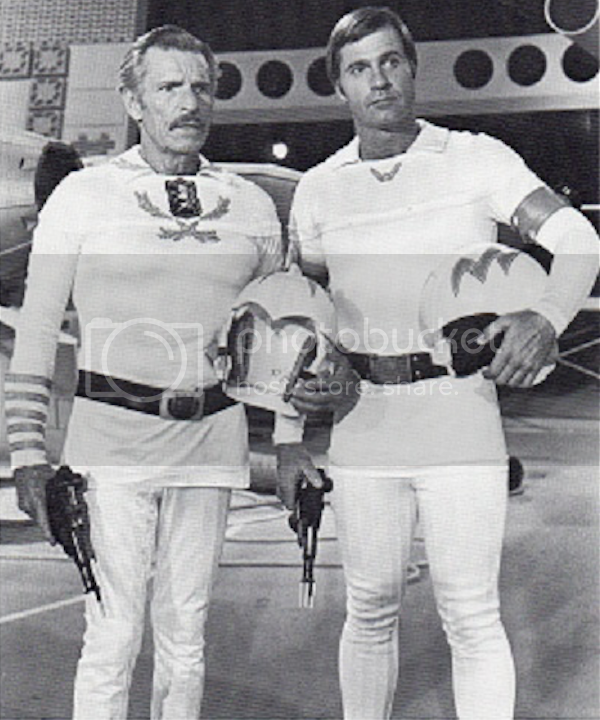 Buck Rogers Costumes Not What Claimed. This is the first in a series of articles on the recent Horror Domain auctions on iCollector. Since the auctioneer was selling obviously fake Star Trek costumes, Francis Scofield decided to do some serious investigation into the other costumes. Here is what he found. Like so many of you that read this blog, I am a collector of props and costumes seen in TV and film. When I purchase an item, I want to know that it has solid provenance by way of reputable auction house, chain of custody, production staff, or other provable means. If an item has no formal provenance, the next best would be screen matching an item to on-screen moments or production/promotional photos. When any of the details are sketchy, I start asking questions. When sellers get dodgy with their answers, I ask myself why. I don’t want to spend big money on fakes at an auction house and get ripped off. Dishonest sellers need to be called out for the protection of the collecting community. Sadly, believe I have an unfortunate example of auction items having virtually zero provenance, sketchy acquisition details, and (I believe) a duped buyer ‘Nicole’. 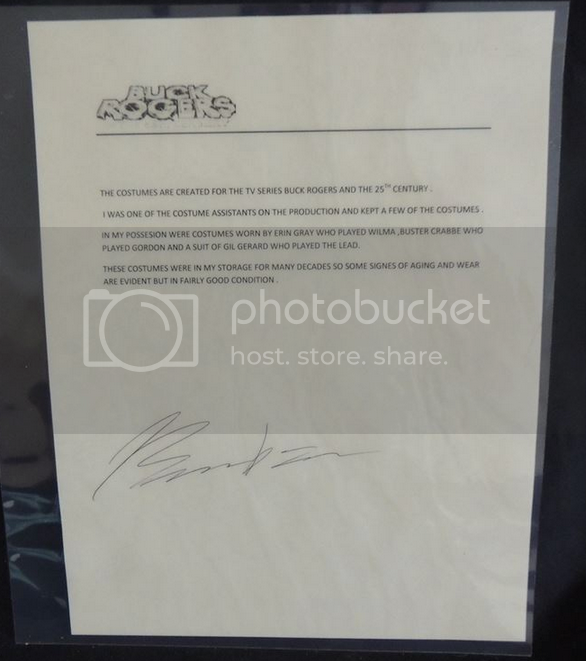 Plainly put, I believe Propdomain’s Feb 7 2015 auction had some fake items in the auction being passed off as screen used/production made and it really grinds at me. 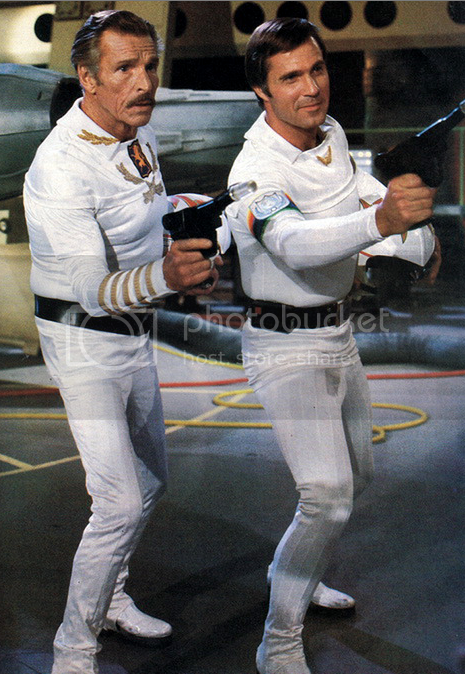 While there are at least 10 items I believe to be fakes, I want to focus on three in particular: The Buck Rogers in the 25th Century costumes, lots 38, 39, and 40. 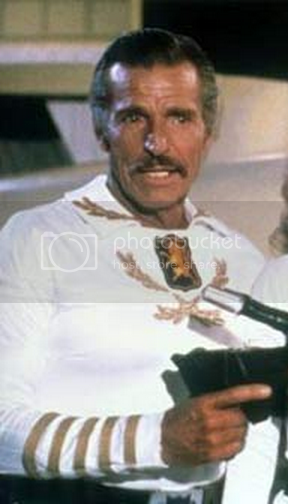 Lot 38 is the ‘Brigadier Gordon’ costume as portrayed by screen legend Buster Crabbe, or is it? Let’s start with the LOA. Fresh off the printer with ‘Buck Rogers’ letterhead, it contains no real description of the item, no name or title of the person issuing it, and a fake looking scribble for a signature. What it does contain is very vague information, and nothing to enable verification. This is bad by any standard, but not a deal breaker. Let’s judge the costume on its own merits. The shirt is what sells this lot, so we will focus on it first. The first thing that stands out is the spacing of the 5 braids on the sleeve and their proximity to the end of the sleeve. The screen cap shows the braids to be spaced apart at the same width as the braid itself with a couple of inches from the end of the sleeve. They are sewn into the sleeve during construction and are ‘locked in’ at the inseam of the arm. They cannot be moved unless you disassemble the forearm. Compare this with the version in the auction. The braids are substantially closer, about 3/8” apart and they end within an inch of the end of the sleeve. In addition, the sleeves on the original go to just about the bottom end of the shirt, whereas the auction version comes up much shorter. Next let’s look at the silver leaves on the chest. They cradle and book end the center patch at such obvious angles that the difference in the two shirts need no comment beyond they are obviously not the same. The gold and silver leaf trims are also available for sale through various vendors. What I think really throws you off the scent is that center patch. The show was made in the late 1970’s and that patch looks very unique. To make a proper forgery, you would need one of those patches, and it’s not like they are still made today, right? Well, guess what… They are. 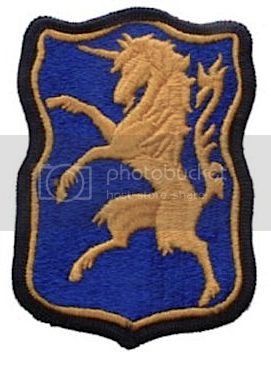 It is a vintage US Army 6th Cavalry Regiment Patch and replicas online are about $7. Even the placement of the patch on the shirt is different. 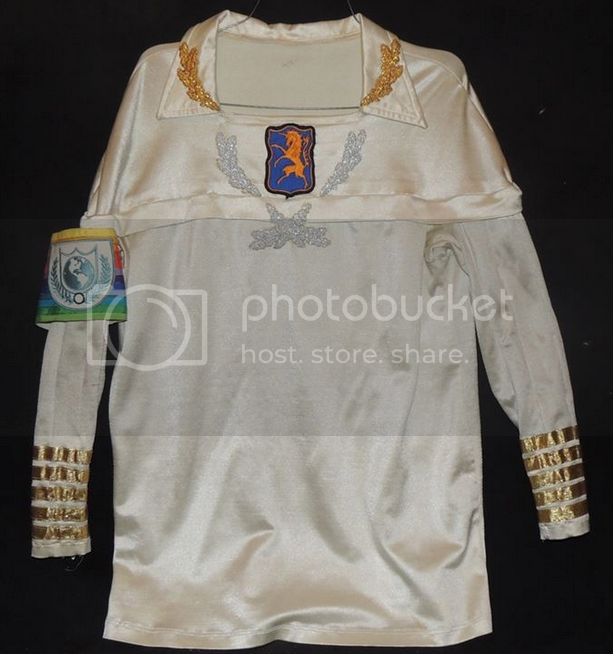 The auction also includes the rainbow striped armband, which the Gordon character never wore. This is also a replica, but that will be saved for later. To my knowledge, the pilot uniforms have elastic waistbanded pants, not a jumpsuit, with darting running up and down the length of the leg. The legs on the jumpsuit in the auction are smooth and incorrect. The cumulative effect of this leads me to believe that this particular item is fake. I cannot speak to the question if David at HorrorDomain knew this at auction or not. 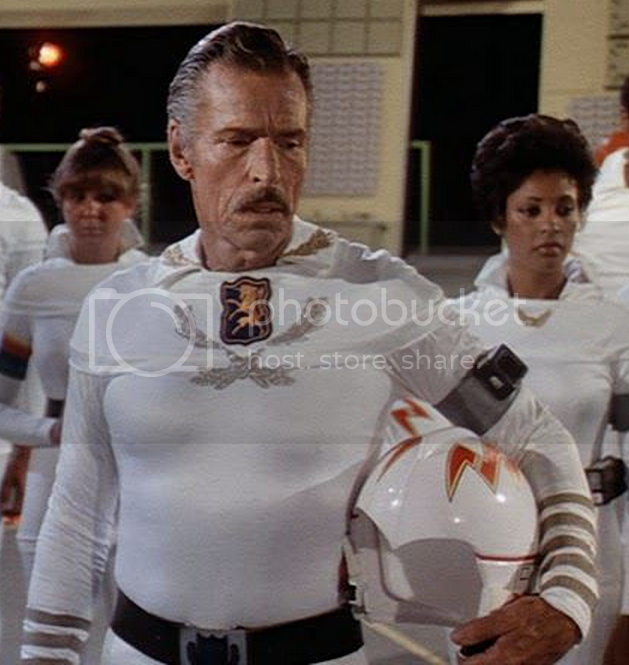 I do know that concerns over the Buck Rogers items were expressed to him. He says he never met the seller directly, but worked through a 3rd party to acquire these items. You decide. Next up…. The Formal Dress Uniform. I have to agree with Francis. The Star Trek costumes were 100% fakes and Dave Brandon the auctioneer, kept making up lame excuses for why he thought them real, never once realizing that the burden of proof was on HIM to prove they are real. He attacked Mark Short, who told him they were fake, he argued incessantly with me when I told him they were fake (constantly arguing they could have been "prototypes" without ANY proof of this). Ultimately, Dave Brandon doesn't understand the basic concepts of authenticity and provenance and so I wouldn't buy anything from his auctions unless you have done your homework and truly believe the item is real. As for the Star Trek and Buck Rogers items, not even close. My advice. STAY AWAY from anything this guy sells. On Tuesday, Screen Junkies, the geek website that brings you "Honest Trailers", came to Propworx new Valencia, CA home to talk about the upcoming Propworx auction. It was a fun time and I hope you enjoy the video. 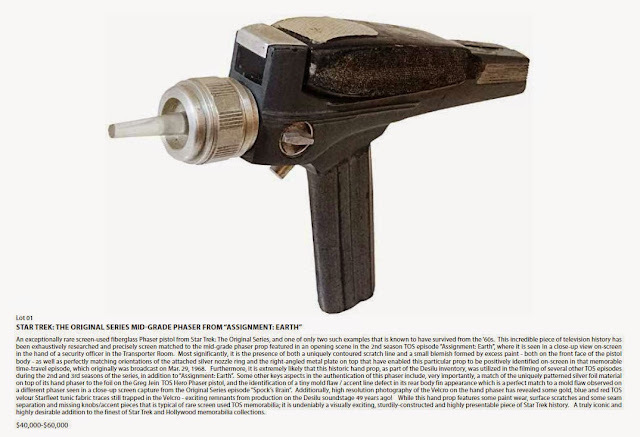 An exceptionally rare screen-used fiberglass Phaser pistol from Star Trek: The Original Series, and one of only two such examples that is known to have survived from the ’60s. This incredible piece of television history has been exhaustively researched and precisely screen matched to the mid-grade phaser prop featured in an opening scene in the 2nd season TOS episode “Assignment: Earth”, where it is seen in a close-up view on-screen in the hand of a security officer in the Transporter Room. Most significantly, it is the presence of both a uniquely contoured scratch line and a small blemish formed by excess paint – both on the front face of the pistol body – as well as perfectly matching orientations of the attached silver nozzle ring and the right-angled metal plate on top that have enabled this particular prop to be positively identified on-screen in that memorable time-travel episode, which originally was broadcast on Mar. 29, 1968. Furthermore, it is extremely likely that this historic hand prop, as part of the Desilu inventory, was utilized in the filming of several other TOS episodes during the 2nd and 3rd seasons of the series, in addition to “Assignment: Earth”. Some other keys aspects in the authentication of this phaser include, very importantly, a match of the uniquely patterned silver foil material on top of its hand phaser to the foil on the Greg Jein TOS Hero Phaser pistol, and the identification of a tiny mold flaw / accent line defect in its rear body fin appearance which is a perfect match to a mold flaw observed on a different phaser seen in a close-up screen capture from the Original Series episode “Spock’s Brain”. Additionally, high resolution photography of the Velcro on the hand phaser has revealed some gold, blue and red TOS velour Starfleet tunic fabric traces still trapped in the Velcro – exciting remnants from production on the Desilu soundstage 49 years ago! While this hand prop features some paint wear, surface scratches and some seam separation and missing knobs/accent pieces that is typical of rare screen used TOS memorabilia; it is undeniably a visually exciting, sturdily-constructed and highly presentable piece of Star Trek history. 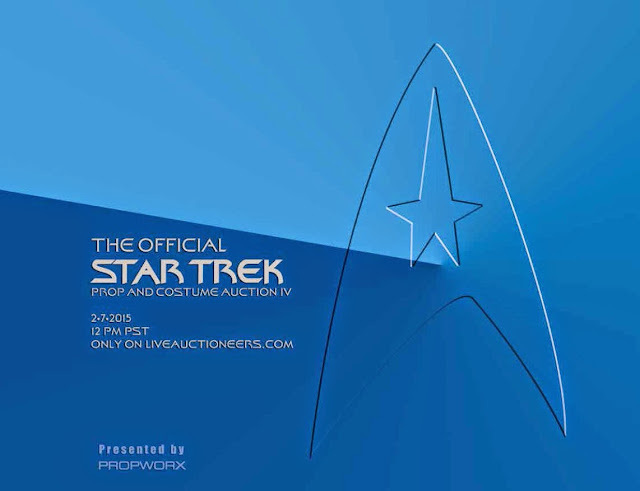 A truly iconic and highly desirable addition to the finest of Star Trek and Hollywood memorabilia collections.